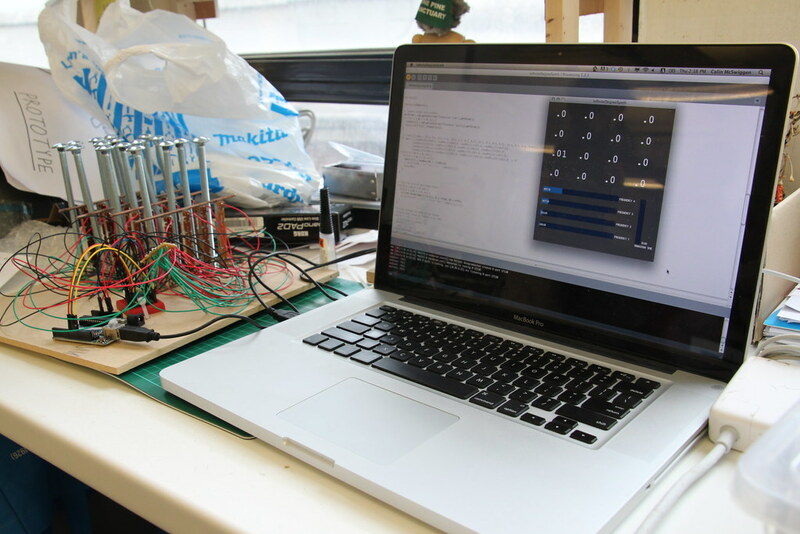 An interface to give electronic musicians more spontaneous control over the sounds they use in performance. 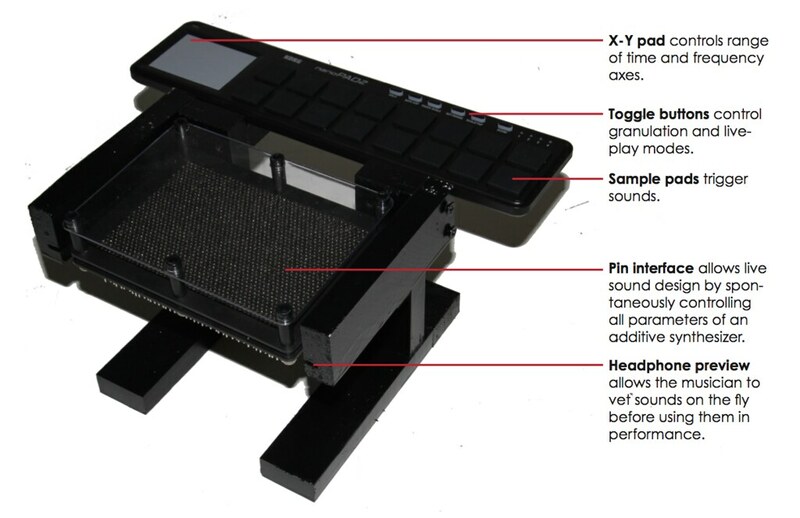 Tactile "feels like" prototype with Korg nanoPAD2. Almost all electronic musicians depend on designed sounds, but most don't make their own sounds, and few incorporate sound production into their live performances in ways that go beyond varying a couple of effect parameters. I think that one major reason for this has to do with an interface problem. To fully specify a sound, you need an infinite number of variables: a whole continuum of oscillators at different frequencies, each varying in amplitude over a length of time. Most contemporary synthesizers give you only a few knobs however, and it's tough to map such a limited interface onto the enormous complexity of the sonic parameter space without ending up with something really complicated and unnatural. Instead, what if we tried to make an interface that could give individual control over a massive number of variables, all at once? My idea was to try a controller based on those pin art boards that you sometimes see in science museum gift shops. By making different shapes on the board, the user can individually vary the heights of a large number of pins at the same time. Map the X position, Y position, and height of each pin respectively onto a point in time and the frequency and amplitude of an oscillator, and you've got a natural control for an additive synth. 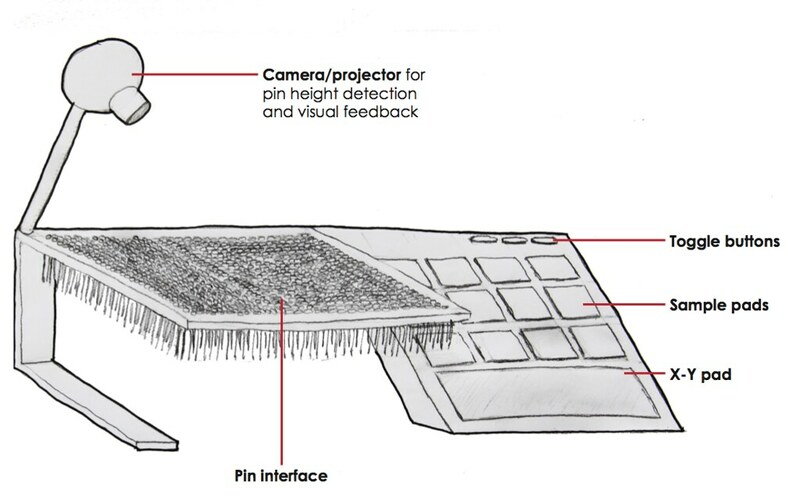 Early, ugly sketch of one possibility for the device layout. 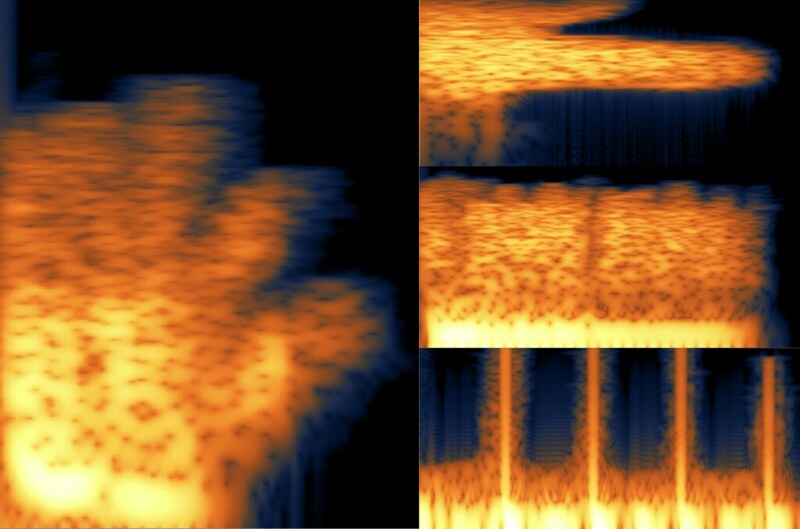 Hypothetical spectrograms of sounds based on images of hands. I haven't yet been able to get a depth map of the actual pin board at a high enough resolution for satisfactory control of a synth, but to illustrate the concept I made a "zoomed in" version of the corner of the board, with 150mm carriage bolts instead of pins. It makes some pretty funny sounds. "Zoomed in" mini-prototype, with control software.